Professional baseball began in 1869, and the National League was formed in 1876. It seems logical that the first cards would have appeared during that same period. Some businesses at the time printed business cards featuring baseball situations, but did not feature specific players. "Buck" Duke is credited with the idea of inserting a small cardboard advertisement into packages of cigarettes, but his company featured actors and politicans on its first cards. This Topps reprint set commemorates the 40th anniversary of Brooklyn winning its only World Series. One of the most storied franchises in sports history, the 1950's Brooklyn Dodgers produced timeless legends Duke Snider, Jackie Robinson, Roy Campanella, Pee Wee Reese, Sandy Koufax, and the list goes on and on. It also had a farmhand at its Montreal minor league team in 1954 named Roberto Clemente...They're all here, along with many more. This 165-card set honors the Brooklyn Dodger teams of 1952-1956 and consists of 127 reprints of Topps and Bowman cards produced during that time. Also, the cards "that never were" have been specially created for the players not featured on Topps and Bowman cards and replicate the design of the card for the year the player would have ben pictured! 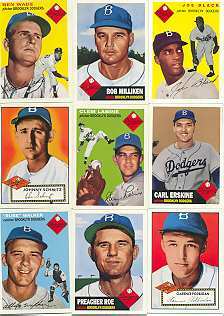 Cards #117-120 commerorate the four games the Dodgers won for the 1955 World Series Championship. This would make a prized asset for any Dodger fan..All Brooklyn Dodger Topps and Bowman cards dating 1952-1956 are included. 33 cards included in this set that were never released. Very difficult to find anymore but we have a few while they last. Checklist included.